Kanye West has been shaking up the internet in recent days. If you're privy to the chaotic ecosystem that is Twitter, you've no doubt witnessed Kanye's full-blown online renaissance, which has included standard fare album announcements, weird philosophical musings, and a left-field bromance with the president. To put it plainly, it's been an inscrutable sh*t show. 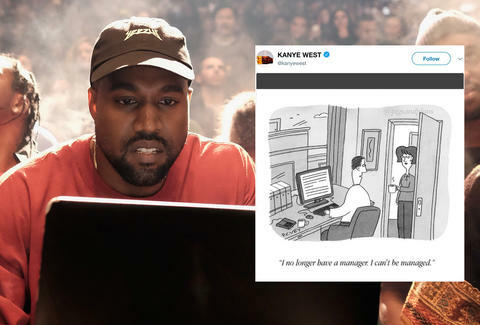 To mark the rapper's acrimonious return to Twitter, the website Pigeons and Planes created the newest batch of quotable Kanye New Yorker cartoons. As The Daily Dot notes, the Kanye/New Yorker mashup is an old meme that dates as far back as 2010. It's clearly a meme that's stood the test of time, as his tweets tend to weave seamlessly with the black and white cartoon drawings that usually form the backdrop for some highbrow comedy. Whether Kanye is knowingly perpetuating the joke, or merely wants reinforce his place in the world as a supreme thinker with "dragon energy," is unclear. Whatever the case, it doesn't seem like we're going to understand it anytime soon.